Tech Review: After testing Firefox for the last three months, I found it to be on a par with Chrome in most categories. In the end, Firefox’s thoughtful privacy features persuaded me to make the switch and make it my primary browser. Do you ever feel that the web is breaking? When shopping online for a toaster oven, you can expect an ad for that oven to stalk you from site to site. If you have just a few web browser tabs open, your laptop battery drains rapidly. And do not get me started on those videos that automatically play when you are scrolling through a webpage. The web has reached a new low. It has become an annoying, often toxic and occasionally unsafe place to hang out. More important, it has become an unfair trade: You give up your privacy online, and what you get in return are somewhat convenient services and hyper-targeted ads. That is why it may be time to try a different browser. Remember Firefox? The browser, made by the nonprofit Mozilla, emerged in the early 2000s as a faster, better designed vessel to surf the web. But it became irrelevant after Google in 2008 released Chrome, a faster, more secure and versatile browser. Mozilla recently hit the reset button on Firefox. About two years ago, six Mozilla employees were huddled around a bonfire one night in Santa Cruz, California, when they began discussing the state of web browsers. Eventually, they concluded there was a “crisis of confidence” in the web. Now Firefox is back. Mozilla released a new version late last year, code-named Quantum. It is sleekly designed and fast; Mozilla said the revamped Firefox consumes less memory than the competition, meaning you can fire up lots of tabs and browsing will still feel buttery smooth. Most notably, Firefox now offers privacy tools, like a built-in feature for blocking ad trackers and a “container” that can be installed to prevent Facebook from monitoring your activities across the web. Most other browsers don’t include those features. After testing Firefox for the last three months, I found it to be on a par with Chrome in most categories. In the end, Firefox’s thoughtful privacy features persuaded me to make the switch and make it my primary browser. Here’s why you should consider it, too. Both Chrome and Firefox support thousands of extensions, which are add-ons that modify your browsing experience. 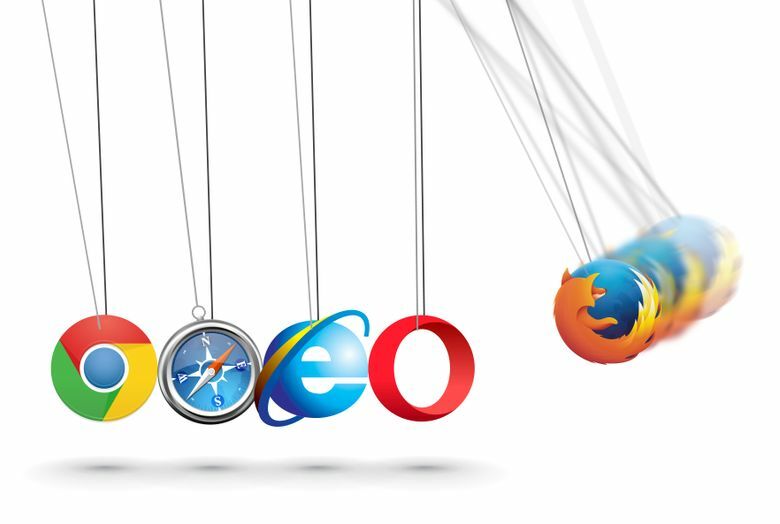 Chrome wins in terms of numbers, with hundreds of thousands of extensions compared with Firefox’s roughly 11,000. But in months of using Firefox, there was not anything I wanted to do on Chrome that I could not also do on Firefox. Both browsers support 1Password, the popular password-management program. Both support extensions that prevent videos from automatically playing when you visit websites. And both support uBlock Origin, the ad blocker recommended by many security experts. Mozilla also offers a Firefox extension called Facebook Container. Normally, Facebook can track your browsing activities even outside its social media site by using trackers planted on other websites like web cookies. With Mozilla’s extension, when you open Facebook in a browser tab, it isolates your Facebook identity into its own container, making it difficult for the social network to follow you outside its site. Firefox especially stood out for some privacy features that are baked into the browser. Inside the privacy settings, you can turn on tracking protection, which blocks online trackers from collecting your browser data across multiple websites. With Chrome, you can install a third-party extension to block trackers — but the fewer add-ons you have to tack onto your browser, the better. Security experts applauded Mozilla for stepping up its efforts on privacy. Google said that privacy and security went hand in hand, and that it led the industry on both fronts. The search giant said it had the only browser with a method for reliably addressing Spectre, the security flaw that was revealed this year and that cannot be completely fixed. Spectre affects the microprocessors in nearly all of the world’s computers, and it can allow the theft of information from one application so that it can be shared with another. Chrome also includes a built-in filter that blocks inappropriate, malicious ads from loading. “You can’t have privacy without security on the web,” said Parisa Tabriz, a director of engineering for Google who specializes in security. In fact, both Chrome and Firefox have tough security. Both include sandboxing, which isolates processes of the browser so a harmful website does not infect other parts of your machine. So if you loaded a website with malicious code, it would be contained within the webpage so it could not infect your files, webcam and microphone. Google said there was one thing it could do better on: the inclusion of privacy settings to block tracking technology, similar to the tools that Firefox includes. Some benchmark websites, which determine the speed of a browser by measuring the responsiveness of different web elements, say Chrome is faster. But some other benchmark sites say Firefox is faster. In my anecdotal testing as someone who juggles more than a dozen web tabs at a time, both were very speedy. Let’s call it a draw. Mozilla’s promise that Firefox consumes less computer memory raises hopes that it should also use less battery life. Yet in my tests on a laptop running a script that automatically reloaded the top 10 news sites, Firefox lasted only a few minutes longer than Chrome before the battery was depleted. On another test, which involved streaming a Netflix video on a loop on each browser, the battery lasted about 20 minutes longer when the Chrome browser was used. Firefox is the No. 2 computer browser, with about 12 percent of the desktop browser market, lagging far behind Chrome, which has about 67 percent, according to StatCounter. Microsoft’s Internet Explorer and Apple’s Safari browsers are even farther behind in the desktop market, with Explorer’s share about 7 percent and Safari’s about 5.5 percent. On Android phones, the Chrome browser is still far more popular than Firefox’s mobile browser. And only lightweight versions of Firefox are available for Apple’s iOS devices. Yet the path forward for Mozilla looks increasingly promising for consumers. In addition to the normal Firefox browser, Mozilla offers Firefox Focus, a privacy-centric mobile browser that blocks trackers by default and purges your web browsing history as soon as you close out of a page. These are privacy-conscious web products that Mozilla is in a position to expand on in the long term. The nonprofit has no direct relationship with advertisers; it gets a small sum from search providers like Google and Bing when a search is conducted through their sites using a Firefox product. For Mozilla, there’s a plus side to being the underdog.